Colors tomorrow; I was so excited about this page that I couldn’t wait any longer to upload it. In my opinion it’s one of the most important pages of The Fourth there’s ever been. Is that a “Puppydog™” or an “Uglycry©”? Straight from the script: “NOW SKARVA’S POINT OF VIEW, LOOKING AT BLANK. BLANK IS UGLY CRYING AT THIS POINT, LOOKS PRETTY PATHETIC.” There’s definitely some puppydog in there too, but I don’t think he’s doing it on purpose. More important than the introduction of Lorelei? More important revealing the knowledge that the pots are filled with milk shakes, delicious milkshakes?! And did that snowman ever return? Hey, I said it was ONE of the most important Clearly the milkshake revelation is the point on which this whole story hinges. Anyway… this page is important not so much for plot reasons but because of what we can learn about Skärva. Okay, change to the last question. Did the snowman every appear in the regular comic again, instead of a splash style holiday page? Not in the flesh… er, snow. They haven’t been back to a cold enough place! Lorelei did draw him once though. I’d be worried this was a trick, but goodie-goodie heroes like Blank don’t do that kind of thing. And I respect him for it. Yeah. Blank is a good kid. Somewhere, deep in his sharky heart, Skaerva cares about Blank… I suppose that’s what a longtime rivalry eventually does to you. Perhaps! But more importantly is just that he’s unable to kill, when it comes down to it. Except probably if someone were to harm Lorelei. Still, I don’t want to rule out those Blank Parties. Skärva is finally showing that he is indeed a human being. It use to be that In war, it was very common that soldiers would very rarely kill someone from the other side, let alone even shoot bullets in their general directions. Because it really is against human nature to actually kill another human being. Especially when they are sobbing and looking up at you. While Blank has already done this many, many times, he knows when he’s won. Skärva, however, has never won before. So, he would be hesitating, and maybe confused at this point. He’s always thought that you have to kill your enemy in order to win, but the human inside of him is telling him that he’s won, and doesn’t need to go further. And now is gonna have to fight with an actual Monster on the subject. I LOVE this so much more than I thought it was going. I kept rooting for the evil coldhearted Skärva, but right now, I am SO happy to see his good side once again! those last few pages were genuinely kind off putting. I love this comment. You definitely seem to understand why I find this page to be so important! This is really good. Like. Really good. It shows /a lot/ about Shark Man’s character and why he does what he does. He’s not a killer, he just wanted a way to win, which he’s looking for back in the present…. YOU GO SHARK MAN I’M ROOTING FOR YOU. Maybe he was so surprised they just flew so far up we can’t see them. They’re hidden behind the sword. “one of the most important pages of The Fourth there’s ever been:” kinda wish you had waited, kinda glad you didn’t. From here I’m just gonna assume I missed something cause I was damned sure Blank had a Chekhov’s gun that was supposed to fire, though I suppose it might still fire against Bladud? Though red herring’s are things that exist. Waited for…? Giving Skärva an actual chance at what he claims to want? Well, you’ll have to see what happens, but the basic idea is that Skärva is cursed. Bladud is not. Skärva could not win against Blank on his own, but he’s been using someone else’s power. Which is indicated by his eyes changing colors from red back to his usual purple I resume? Cmon Skarva we both know ya wouldn’t give up your glorious purple eyes. Well, it’s not like he’s possessed or anything (although we did consider that, or at least the jewel having a corrupting influence on him). The power is all in the sword and the psychological struggles are all his. His eyes do change colors already! They get lighter the more excited he is, and orange when he’s mad. I don’t think we’ve ever seen the Red of Bloodlust before though. In a way it was to signal that he wasn’t truly himself, but not in a “Bladud is controlling me” way and more of just losing control. His normal eyes are lovely though, yes. Waited for the colors, so your audiences first impression would be its full glory. Aaah I see. Well, I hope you enjoy the colors now! They did come out rather well, and they do add quite a bit. Perhaps I should have waited after all, but considering the response was strong even without them, I don’t really regret it. I see you also saw the new Star Trek. Heh, Chekhov’s Gun is a theater term, from a saying by Russian playwright Anton Chekhov (I actually directed a play based on his humorous short stories in the spring!). He famously said that if you show a gun onstage in the first act, it needs to go off in the second act. Basically, every prop should have its purpose. Or don’t point out things that you don’t intend to use. Unless Chekhov (rest in peace to the actor) in the new star trek actually had a gun that was plot-significant… which would be amazingly trope savvy. I actually don’t know what Venalitor is referencing that Blank is supposed to have. The bottles, maybe? That was just a joke about bottles being the most important thing to Blank; it’s not going to come back. Yeah, the bottles are what I was referencing. Oh! I’ve never heard of that. You learn something new every day. I don’t want to spoil it for anyone that hasn’t seen it, but yes he does. (And depending on how you divide it it could be considered the second act. Not positive though). Since it’s not the bottles, the only thing I could think of to get Blank out of this (other than Skarva’s conscience), would be a hidden Farore’s Wind, or perhaps an extra Piccolo of Transport (or other small, magical instrument). By the way, it looks really great with the colors! I’m not saying it didn’t look good before, but the colors really add to the effect, particularly the shading in the third panel. villains being merciful is always interesting to see, i think i remember a while ago something being mentioned about how he still had standards and that’s why he wouldn’t simply send minions out to kill blank? it’s really telling about his character, and the buildup is great. also hey look, a wild spoiler appeared! Yeah, he’s always wanted to defeat Blank in an honorable way, following the hero/villain tradition that has been established (so in that way he DOES follow in his father’s footsteps, he just actually takes it seriously instead of it being entertainment and a business venture). Otherwise he wouldn’t prove that he’s better, just that he’s more ruthless. It’s like the difference in honor and glory between winning an Olympic gold medal, and winning an Olympic gold medal because you broke all the other competitors’ legs beforehand. Man, and I thought the last page was intense! It will be very interesting to see how this turns out, though it definitely helps add a bit more depth to the whole Skarva-Blank rivalry. Though I doubt it would ever become a friendship (like Dedede-Kirby), it’s definitely more a Mario-Bowser (they fight a lot, and the antagonistic is sometimes more evil than other times, though he never kills), then the Wily-Mega Man I originally thought (one would ruthlessly destroy, while the other hesitated when given the opportunity to pull the trigger). And yes, I just went full nerd by analyzing famous video game rivalries. Thank you and good night. Skarva: CAN’T YOU SEE I’M HAPPY? I’M TRYING TO CLAP ALONG HERE. Skarva: GODDAMMIT I WAS A ROOM WITHOUT A ROOF!!! In all seriousness though, this is a really good character-building moment for Skarva. All his live he’s really been gung-ho about this evil-business. He’s not at all like his folks who treated it like a stage-play or some sort of job. He really, actually, factually wants to be a true villain. … but a true villain would kill the hero. WILL SKARVA DO IT? This is a fun comic. Phew! Glad to see he’s a different sort of evil than I imagine the First is! He doesn’t say a word in this strip, and yet it tells you more about him than most of them have up to this point. That’s right. 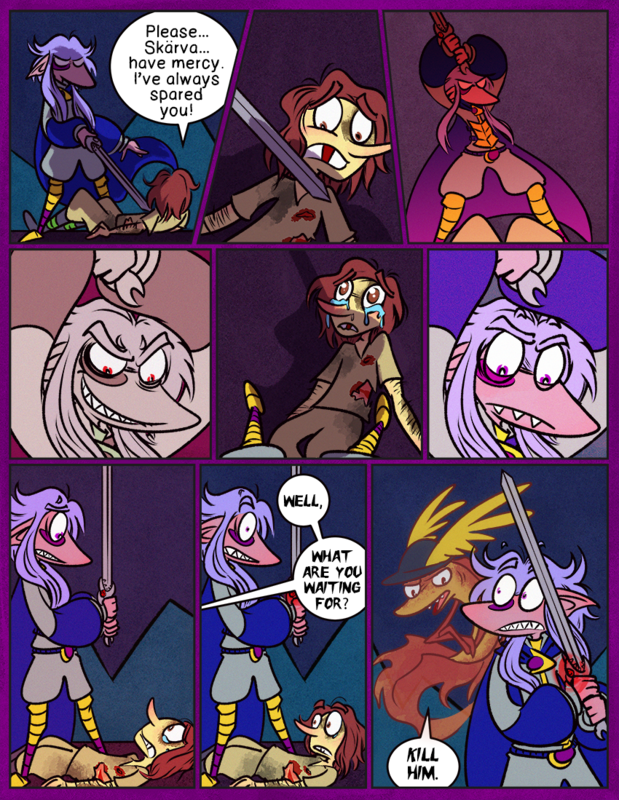 Funny thing is I originally wrote this comic, and when Victor came to edit it he took out everything I had Skärva say. And it’s just much better this way. That’s why Victor is the official writer…! One of my favorite things about this comic is how despite Skärva’s villainous schemes and villainous goals (I mean, fighting the gods? ), he’s never been someone who could really be called evil. If he was, he wouldn’t be able to be swayed by Lorelei the times he comes close to doing something truly heartless or keep up the good conditions for his minions that the Third put in place, and he certainly wouldn’t feel conflicted at finally having his long time nemesis at his mercy. Not that you could really call him a good person either (see said villainous schemes and goals), but at the same it’s hard to blame him, considering the extremely visible nature of his curse and all the obstacles it would pose to being accepted by society (if that was ever something he cared about in the first place). That’s the saddest part about him in a way, that he probably could be a good person, but circumstances reaching back to before he was born have largely robbed him of the means and the motive to even try. From that perspective, it becomes hard to argue that Skärva’s goal of defeating the gods is really that villainous after all. Though Skärva himself might be doing it for fundamentally selfish reasons, it’s hard to disagree that the gods’ active intervention in the past has largely resulted in injustices perpetuated against large groups of people only tangentially related to whoever was actually deserving retribution. Some of these affected peoples have managed to cope to various degrees, such as the Lurkins (whose circumstances and severity of being cursed reek of extreme pettiness on the part of the gods) or the Third, but we also see cases like the Second, who drove himself mad trying to remove the family curse, or Blank, who despite being blessed by the gods seems to be quite unhappy with his role as Idenau’s designated hero. Basically, the gods’ record of intervention after the actual creation was finished seems to be one of pettiness and thoughtless collateral damage. There’s every indication from what we know that the First actually did deserve retribution, but certainly not all of his followers and descendants. From this perspective there’s nothing to show that the gods actually deserve people’s loyalty anymore, and anything good that came out of their intervention is arguably a credit to the people themselves. Whew. I know that kind of went of an a tangent, but long-time-reader-first-time-commenter and all that. On a similar train of thought, I would say that the Fourth is around the realm of being an anti-villain, where he still has evil goals, but is more moral and on occasion preforms a heroic deed or two. Even Blank could be considered as a proper foil to the Fourth, and farther as another anti-villain, As he constantly ruins our protagonist’s plans, and doesn’t even stop to contemplate the near genocide he is committing on Skarva’s minions. I love walls of text! Heh, I actually had to cut it a bit short just to get it out there in the first place. Following up a bit, I was rereading some of the earlier parts of the chapter, and it kinda says a lot about how resigned people are to the prospect of being cursed by the gods for associations that the inhabitants of Castle Bladud were more ready to credit their circumstances to that than to their obviously evil lord.